ESSENTIAL QUESTION: What are the constitutional powers and functions of the Judicial Branch? A great reference is the official US Senate Annotated Constitution linked here! You may work in groups, but answers must be In Your Own Words. This WILL be used for the GRQ quiz on Tuesday. ESSENTIAL QUESTION: What is the organizational structure and jurisdiction of the Judicial branch? ESSENTIAL QUESTION: How are Justices selected? What is Toby Ziegler’s concern about Chief Justice Ashland? Why does Chief Justice Ashland feel he has to stay on the Supreme Court as long as possible? What is one reason that might make it difficult for the President to nominate an activist judge to the Supreme Court? What THREE Litmus Test Questions might be asked of potential Justices during their interviews? Based on the descriptions and arguments of Judge Baker-Lang , is she an ‘activist’ or ‘strict constructionist’? How does Judge Shelton describe a ‘moderate’? What are Josh Lyman’s arguments against nominating a ‘moderate’? What does Lyman mean when he advocates a ‘balanced court’? Why does Judge Mulready believe D.O.M.A. is unconstitutional? Makeup: Watch Democracy in American #9: The Courts and the Rule of Law and answer the assigned questions on the worksheet in complete sentences. This MUST be turned in within 24 hours of your absence--any assignment turned in late will receive a penalty. The debate from Milwaukee, Wisconsin, on Fox Business, and will only consist of the top 8 candidates in national polls. ESSENTIAL QUESTION: What resources are needed to bring a case to the Supreme Court? ESSENTIAL QUESTION: What is the procedure involved in arguing a case before the Supreme Court? 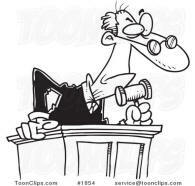 Does the court read the briefs before oral argument? Who goes first in oral argument? How much time is allowed for oral argument? How do you start your opening argument, and what is the best way to structure your argument? Will the judge ask you questions? What is the strongest form of support in an oral argument before an appeals court? Assignment: In groups, Read for the Rubric, Organize your Essays, and OUTLINE the possible ideas and conclusions which would receive credit under the COMPLETE-CORRECT-CONNECT guidelines. 1. The judicial branch is often assumed to be insulated from politics. However, politics does affect many aspects of the judiciary. a. Describe two political factors that affect presidents’ decisions to appoint members of the federal judiciary. b. Identify two political factors that affect the confirmation process of a president’s nominees and explain how each factor complicates a confirmation. c. Explain how one legislative power serves as a check on court decisions. d. Explain how one executive power serves as a check on court decisions. 2. The United States Supreme Court receives many appeals, but it hears and rules on a small percentage of cases each year. Numerous factors influence the actions of the Court, both in deciding to hear a case and in the decisions it hands down. b. Explain how judicial review empowers the Supreme Court within the system of checks and balances. c. Describe the process through which the Court grants a writ of certiorari. d. Define and explain how each of the following influences decisions made by individual justices when deciding cases heard by the Court. 3. The judicial branch is designed to be more independent of public opinion than the legislature and the executive. Yet the United State Supreme Court rarely deviates too far for too long from prevailing public opinion. a. Identify and describe two ways in which the United State Supreme Court is insulated from public opinion. b. Identify and explain how two factors work to keep the United States Supreme Court from deviating too far from prevailing public opinion. c. Should Congress set term limits for Supreme Court Justices? Explain your reasoning (be specific). Review: Unit 1, 2, 3, 4, and 5: Use online chapter notes, GRQs, and Textbook site practice section quizzes. ALL UNIT 5 FORMATIVE REASSESSMENTS ARE DUE; NO MORE REASSESSMENTS FROM UNIT 5 WILL BE ACCEPTED AFTER TODAY. This test will consist of 45 multiple choice questions in 35 minutes (summative), and one 10 minute FRQ (formative) from the material and concepts in Units 1, 2, 3, 4, and 5. Time will be called at the completion of the multiple choice section and that section will be collected; you will be expected to move on to the essay when time is called. The test will be counted out of 50 points..
Bring: Pencil for Unit 5 test! ALL essays below 7/10 SHOULD be reviewed, revised, and rewritten. ALL rewrites MUST be completed by ONE WEEK from the date the original essay grade is posted, NOT one week from the date YOU discovered the grade. Rewrite grades may be LOWER than the original, and will count. It is expected you will conference, review, reflect, and revise BEFORE you submit your essay to Turnitin, and will READ the comments and rubric score on Turnitin after it is graded.